Coming across this aged Bordeaux is like finding a valuable, classic antique in a second hand store. 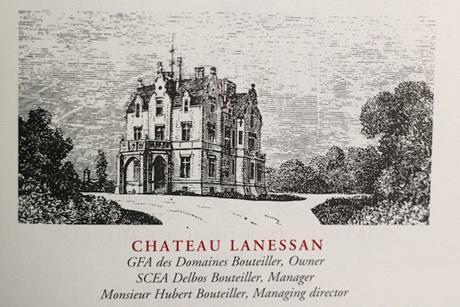 The venerable estate of Lanessan rises serenely above the gently rolling and geologically complex plain of the Medoc, just a stone's throw from Chateau Beycheville and Gruaud-Larose. The 2002 vintage in the Left Bank was spotty - a not unusual occurrence in Bordeaux, where results for one estate can differ wildly from its neighbor just across the road. And as often happens in the complex Medoc, all but the most dedicated and vigilant Bordeaux buyers overlooked the wines that turned out well. 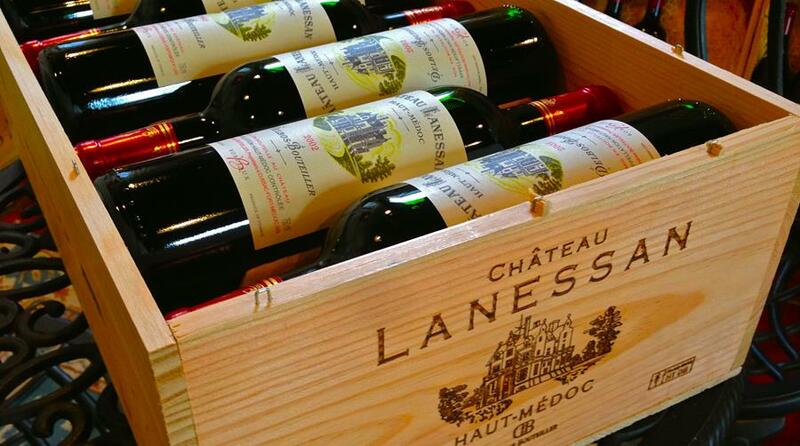 This worked in favor of consumers by keeping a lid on the ever-escalating price of top quality Bordeaux - like this exquisite, old fashioned 2002 from Lanessan that I had the opportunity to revisit last week, when an East Coast importer uncovered a few cases available from the chateau. And as it turns out, it's drinking better than it ever has, far surpassing anyone's expectations for the vintage at the time. The 14 years of bottle age have transformed this blend of cabernet sauvignon (60%), merlot (30%), cabernet franc (5%), and petite verdot into an open and generous wine that offers all the charm and complexity you could ask for in a quality Bordeaux at this modest price point. Lilting aromas reminiscent of dried rose petals from an old cedar chest, with hints of raspberry jam, black tea and lavender are echoed on the silky palate; and augmented by subtle preserved red currant / cassis flavors supported by very fine tannins. In some way it puts one in mind of a clean lace hankie that has been lying in grandmas' sachet drawer for years - delicate, gently perfumed and old fashioned, but strangely comforting. A better example of the transformation of Bordeaux through proper aging can't be imagined - especially for under thirty dollars. With this wine you'll drink like landed gentry of the nineteenth century now, without waiting decades. No more excuses about not having the patience or cellar to age Bordeaux, since it's already been done for you! An absolute classic with spring lamb. Taste it Friday. Nebbiolo at the top of the world. 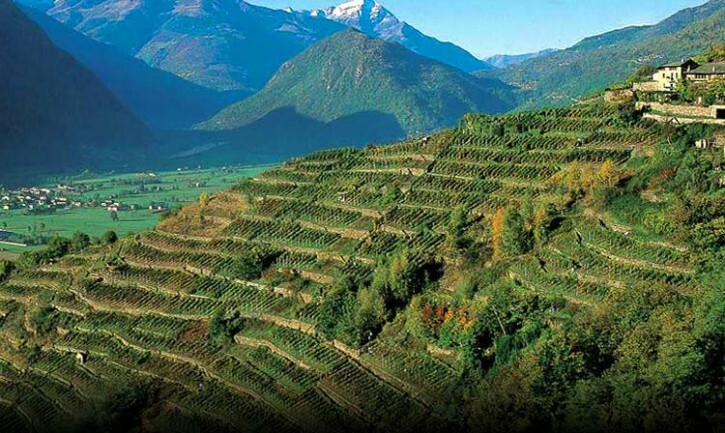 The steep, terraced hills of the Valtellina region northeast of Milan have been producing grapes for great wine since the days of the Romans. The early Roman poet Virgil mentions the quality of these wines and throughout the middle ages "Rhaetian" wines were celebrated throughout northern European courts. Today the respected house of Sertoli-Salis carries on this great tradition by crafting terroir inflected nebbiolo of great character and longevity. In fact time is usually the only thing required to unlock the tremendous aromatics and pure red fruits of the exceptional, often overlooked nebbiolo of Sertoli Salis. That's why its such a pleasure to introduce the 2007 Capo di Terra to the Authentica Wine Club this month. Grown in the middle slopes of the dramatic limestone hills northeast of Lake Como on the road to Austria, the Capo di Terra has the charming and seductive aromatics of a mature Burgundy combined with many of the flavors and aromatics that make great Barolo so coveted. The greatness of the 2007 vintage in Italy is still being talked about today and its quite remarkable to find anything remaining from this legendary vintage - especially anything as beautiful and modestly priced as this perfectly mature nebbiolo. Gentle aromatics of subtle wild raspberry, violets, sweet tea and vanilla are carried forward on the sumptuous, finely textured palate. An exceptional nebbiolo in every way and a great expression of Valtellina - for an incredibly modet price. An impressive Bordeaux blanc for well under twenty dollars. I'm always surprised by how many wine drinkers with a taste for sauvignon blanc, semillon and the other white varieties of Bordeaux never drink the real thing. For reasons that probably have more to do with marketing and image, New Zealand and California sauvignon blanc are far more prevalent on wine lists and retail shelves. But like Bordeaux rouge, the landscape for the whites is complex and confusing, especially when you throw in the category of sweet Bordeaux from Sauternes, Loupiac and other communes upstream from Graves. That's why you need a good wine shop to guide you. 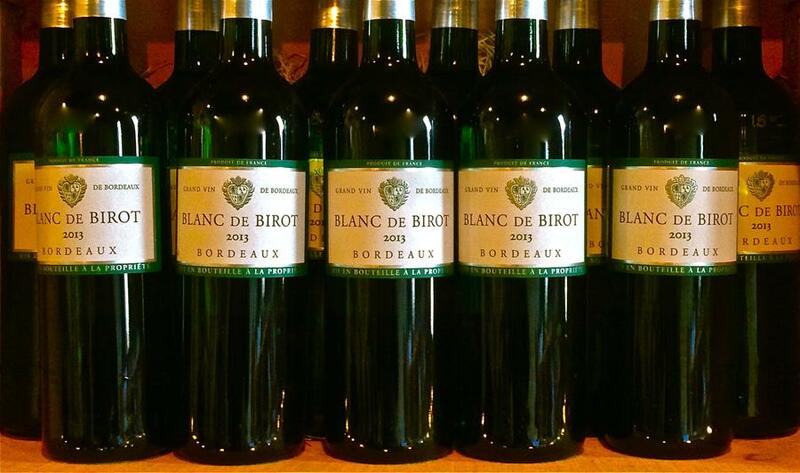 For those of you who appreciate snappy and aromatically complex sauvignon blanc, try and make it by tonight (or tomorrow if any remains) to taste the Chateau Birot 2013. This powerful and expressive white is a blend of 65% sauvignon blanc and 35% semillon, a perfect balance between the honeyed richness of the semillon and the structured citrus fruits of the sauvignon blanc. You'll be surprised how strongly aromatic this wine becomes with air - and although the structure is dominant at this point, the fruit component is dense and concentrated. A lovely wine with rich shellfish, white cheeses, and white meats. The best of both (wine) worlds. Over the last few years the energetic Hollywood producer Mark Tarlov has been involved in several high profile wine ventures in both Oregon and Burgundy, most notably as a founding member of the Evening Land label. Now, after a somewhat tumultuous tenure and abrupt ouster from E.L. he has established his own Oregon / Burgundy project know as Maison l'Envoyé. So far, the wines under this new incarnation of Tarlov's lofty ambitions are noteworthy, with the Bourgogne Blanc 2012 as an example. This bright and energetic chardonnay is sourced from top vineyards in the Macon - specifically the villages of Vire, Fuisse and Prisse - and it shows great cut, mineral depth and fruit intensity. Lemon accented orchard fruits, white citrus flower aromatics and a toothsome texture highlight this excellent Bourgogne Blanc. It's an excellent value for $20.00 that you can taste Friday. Don't miss it and keep an eye out for the Oregon releases from this new venture coming soon. 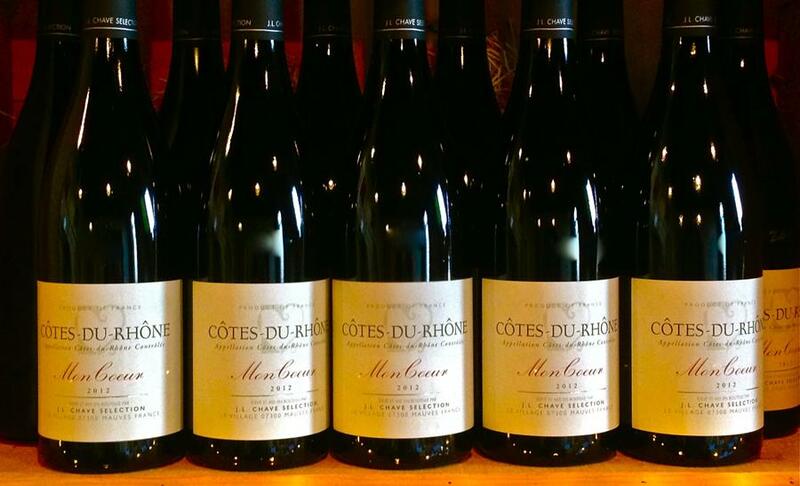 Although the label says Cotes du Rhone, the JL Chave Mon Coeur is far superior to 95% of the wines found with this designation. Organically farmed grenache, syrah and other Rhone varieties are sourced from growers Chave has worked with for years. His fanatical diligence ensures that only the very best fruit is employed in this and other JL Chave bottlings, which raises these wines far above the competition. The 2012 vintage was excellent and this finely crafted grenache based blend shows a kaleidoscope of flavors and aromatics from dark, sweet mocha, deep brambly red fruits and menthol to blackberry, smoky meats and cocoa. A tremendous value that would shame many Gigondas and Vacqueyras that sell for far more. An Authentica favorite. Taste it tonight. Back in stock: "Les Gourmets"
Tasters couldn't believe the quality of this wine and it has sold out two weeks running. This fresh and floral sauvignon blanc from Touraine along France's Loire River is like a breath of spring, and a perfect accompaniment to chevré salads and other spring-like fare. Grab a few bottles this week before it disappears again. By the way, we'll have the flat screen set up today and tomorrow so you won't miss a moment of March Madness. This week's SuperPour: Meursault rouge from Jobard. 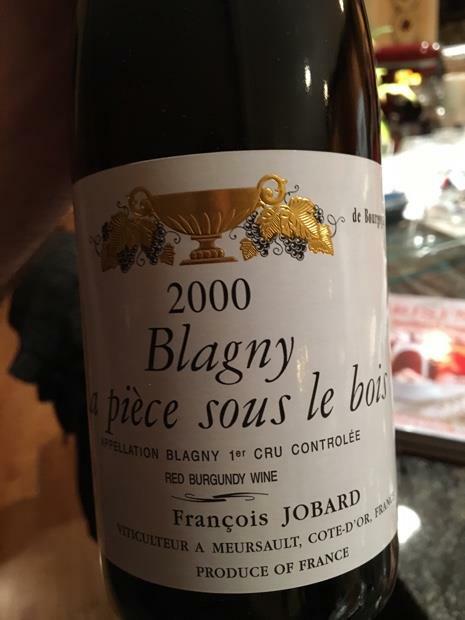 Meursault master Francois Jobard made a rare red Burgundy from his famous Blagny Piece Sous le Bois vineyard until 2006, when he grafted the 80 year old pinot noir vines over to chardonnay. We'll have that last vintage (the 2006 - not the 2000 pictured above) open for tasting (and for sale) tonight and tomorrow. Don't miss this rare wine!